Hello, I had kind of checked the forums for a bit but, never joined it. So, now I did. 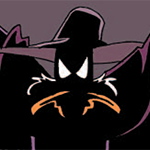 I'm a big Darkwing Duck fan since 2010, thanks to the BOOM! Comics. I had been quite disconnected from the fandom for a long time. I had started to integrate with quite recently.